Injection molding is one of the most important processing methods in the plastics industry: Every year, almost 55 million tonnes of plastics are processed worldwide to almost any kind of molded part. Since the use of this method allows for a flexibility of size and form, possibilities of plastic design expanded enormously. Injection molding enables the substitution of traditional materials due to the low weight and the freedom of design. 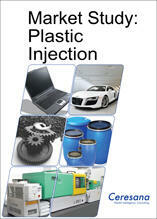 The market research company Ceresana analyzed the global market for plastics for injection molding. In 2015, about 54% of the plastics used for injection molding were consumed in the region Asia-Pacific; North America and Western Europe followed with market shares of 15.4% and 14.3%. The most important sales market for injection molded products is the packaging industry which mainly protects food: containers, cans, mugs, bowls, boxes, and closures of any kind. Packaging made of plastics offers numerous advantages over other materials. Besides their low weight and a reduced fracture susceptibility, plastic packaging can profit in some segments from its transparency or resistance against chemicals. The second largest and at the same time most dynamically developing sales market are products for the transportation industry. From 2015 to 2023, Ceresana expects global demand in this application area to increase by 3.7% per year. The present study analyzes the market for plastics used for injection molding, particularly for the plastic types polypropylene (PP), polyethylene (LLDPE, LDPE, HDPE), polyamide (PA), acrylonitrile butadiene styrene (ABS), polycarbonate (PC), polystyrene (PS), and other products. Polypropylene (PP) is the most important plastic type for injection molding: Over the past eight years, global demand for products made of PP rose by an average of 3.8% per year. The second most important plastic type for injection molding is polyethylene with a market share of 20%. However, there are significant differences within the particular sales markets. For example, the share of demand for polypropylene in the segment packaging amounts to almost 70% while its share in the construction industry only totals 12%. Chapter 1 provides a presentation and analysis of the market for plastics for injection molding – including forecasts up to 2023. Data on demand and revenues are analyzed for the regions Western Europe, Eastern Europe, North America, South America, Asia-Pacific, the Middle East, and Africa. Chapter 2 provides market data for the 16 most important countries, that is, country-specific information on demand and revenues. Demand is analyzed in detail split by several application areas and product types. Chapter 3 thoroughly examines the application areas for plastics for injection molding: packaging, construction industry, transportation, electrical and electronics, industrial products, other applications. These sales markets are split by both the world regions and the most important countries. Furthermore, demand for the particular plastic types split by application areas is given. Chapter 4 deals with demand for the particular types of plastics: polypropylene (PP), polyethylene (LDPE, LLDPE, HDPE), polyamide (PA), acrylonitrile butadiene styrene (ABS), polystyrene (PS), polycarbonate (PC), other types of plastics.